The new Apollo 11 Series of silver and gold coins from the United States Mint feature beautiful curved formats and celebrate the 50th anniversary of the famous NASA mission. Apollo 11 sent a three-man crew to the moon, with two astronauts setting foot on the celestial bodies as the first human beings to ever do so. Right now, 2019 $1 Proof American Apollo 11 50th Anniversary Silver Coins are available to purchase online from JM Bullion. Arrives inside of a protective capsule and US Mint box that includes a Certificate of Authenticity! Commemorates the 50th anniversary of Apollo 11! Limited mintage in the overall series of only 400,000 silver coins! Contains .8595 Troy oz of .999 pure silver. On the obverse is mankinds footprint on the moon. The reverse depicts a photograph close up against Buzz Aldrins helmet. Curved coins with convex reverse and concave obverse. P mint marks from the Philadelphia Mint. Each of the 2019 $1 Proof American Apollo 11 50th Anniversary Silver Coins in this listing comes to you with a protective capsule to hold the coin and a US Mint commemorative box to house the capsule. Included with each coin is a Certificate of Authenticity and youll find a P mint mark on the coins obverse side. The US Mint is only striking 400,000 coins in total in the BU and proof silver coins for this commemorative series. These beautifully curved coins from the United States Mint celebrate 50 years since the Apollo 11 mission successfully sent men to the moon for the first time in human history. Apollo 11 was the first successful manned space mission to another celestial body and saw Buzz Aldrin and Neil Armstrong spend a total of 21.5 hours on the lunar surface. The obverse side of the 2019 Proof American Apollo 11 50th Anniversary Silver Coins is concave and depicts the footprint from one of the astronauts as they commenced with their moonwalk during their time on the lunar surface. Engravings include the national motto, the word Liberty, and the words Mercury, Gemini, Apollo along with the phases of the moon shown between each. 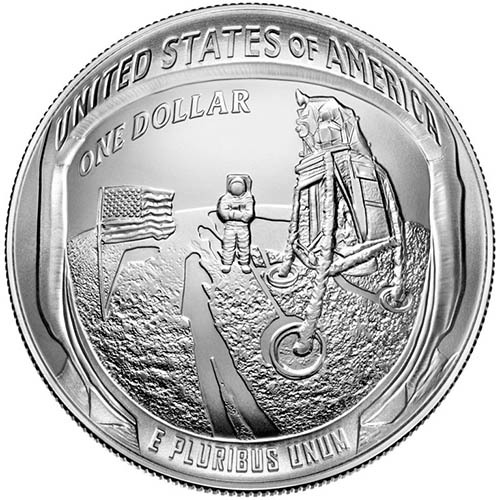 On the reverse of 2019$1 Proof American Apollo 11 50th Anniversary Coins is a recreation of the photograph taken up against Buzz Aldrins visor as he and Armstrong went through their moonwalk on the surface. Visible in the reflection of Aldrins visor is Armstrong, the lunar lander, and the American flag. If you have any questions, please dont hesitate to reach out to JM Bullion. You can call us on the phone at 800-276-6508, chat with us live online, or simply send us an email.